Doctors and other health care providers are expected to provide patients with appropriate medical care. However, when a medical professional acts negligently and causes harm to a patient, the patient has a right to take legal action. Medical malpractice can often leave victims suffering severe, life-changing injuries that require ongoing treatment or result in death. If you or a loved one was injured due to medical negligence, the legal team at Greg Coleman Law is prepared to fight for you in pursuit of maximum compensation. Our Knoxville medical malpractice lawyers have the skillset you need and the compassion you deserve to help you during this difficult time. We have helped many injured victims throughout Knox County obtain the justice they are entitled. Our main office is centrally located in Knoxville and is less than 10 minutes away from two major hospitals: The University of Tennessee Medical Center and East Tennessee Children's Hospital. Contact us today to schedule your free consultation so we can review your case and determine if you have a valid claim. We can help you every step of the way by gathering all the facts, interviewing relevant witnesses and examining medical records to help you build a strong case. Our firm works on a contingency fee basis, meaning there are no upfront costs unless we recover compensation for your injuries. We are here for you. Call (865) 247-0080 or fill out our Free Case Evaluation form today. We look forward to helping you. Call (865) 247-0080 now. When a doctor misdiagnoses a condition or fails to diagnose the correct illness, it prevents the patient from receiving necessary treatment. A doctor may incorrectly conclude that a patient has no illness or diagnose a patient with a condition he or she does not have. Common diagnostic errors include failure to diagnose cancer, recognize symptoms of a heart attack or stroke or identify a pulmonary embolism. When a doctor fails to diagnose a condition for some period of time, the delay in treatment could cause the condition to worsen and reduce the likelihood of recovery for the patient. A doctor may fail to order the necessary tests that would have led to a correct diagnosis or fail to see the signs of a disease on an X-ray or CT scan. Other more serious examples which can be fatal include a delay in diagnosis for coronary artery disease, appendicitis or serious internal trauma. A surgical error in the operating room can have a significant impact on a patient’s quality of life. Medical malpractice can occur when a surgeon performs the incorrect procedure, performs unnecessary surgery, damages organs, tissues or nerves during surgery, administers the wrong dosage of anesthesia, uses non-sterile surgical equipment or leaves medical equipment inside a patient. Anesthesia errors can not only happen during a procedure, but also during a preoperative medical evaluation. Even the slightest mistake can have devastating consequences resulting in permanent injury, brain damage or death. Medical malpractice can occur when an anesthesiologist fails to review a patient’s medical history for allergies or other complications, does not inform the patient of preoperative requirements such as fasting before surgery or fails to monitor a patient’s vital signs. Birth injuries can be quite severe, causing permanent injury or even result in the death of the mother or baby. Medical negligence can occur before, during or after childbirth. A health care provider can fail to perform a C-section, monitor fetal vital signs or diagnose a mother’s medical condition, identify birth defects or ectopic pregnancies, use improper tools for delivery or mishandle a difficult birth. A medication error is one of the most common forms of medical malpractice. A doctor may fail to prescribe the correct medication, administer a medication correctly, prescribe a medication without taking notice of a potentially harmful drug interaction or fail to warn patients of a medication’s risks. Medication errors can have serious harmful effects which can be life-threatening. If you suspect your doctor was negligent in any way, you should consult a Knoxville medical malpractice lawyer right away. We can review the details of your case to see if you may be able to recover compensation. Get started now by calling (865) 247-0080 for your free case evaluation. Medical malpractice is not just limited to doctors, surgeons and nurses. Any health care provider can fail to act within the accepted standards in the medical community and cause injury or harm to a patient. Medical negligence can occur in settings where health care providers come in contact with patients, such as in doctor’s offices, nursing homes, long-term care facilities, hospitals, clinics, and mental health facilities. Due to the sheer scope of medical malpractice, it is important to consult a skilled attorney to determine the party or parties responsible for your injuries. Our medical malpractice lawyers in Knoxville will actively fight to hold them accountable for negligence by helping you file a lawsuit. To have a valid medical malpractice case, you must establish that the doctor or health care provider breached or violated the standard of care while providing you medical treatment. The standard of care is the type of care that a reasonably competent and skilled health care professional with a similar background within the medical community would have provided under similar circumstances. Doctor-patient relationship – To file a medical malpractice claim, you must first establish that a doctor-patient relationship existed between you and the doctor that agreed to treat you. This is usually established during your first doctor visit or when you were first treated by the doctor in an emergency situation. Breach of duty – The next step is to prove that the doctor failed to uphold his or her duty of care, breaching the acceptable standards of the medical community. In other words, the doctor did not provide a level of care that another medical professional with similar experience and training would have provided in a similar situation. Causation –You must then show that your doctor’s action or inaction directly caused your injuries or worsened your condition. For example, had the doctor not misdiagnosed the pain and swelling in your leg as a simple leg cramp, you would not have gotten a serious blood clot in the leg causing further injury and requiring surgery. Damages – The final step is to show you suffered damages due to the doctor’s negligence. Damages can include anything from medical costs to lost wages and pain and suffering. Medical malpractice cases can be difficult to prove without extensive legal knowledge. A Knoxville medical malpractice attorney can reach out to medical experts to testify on your behalf to try to prove that your injuries were the result of negligence and not due to a pre-existing condition. 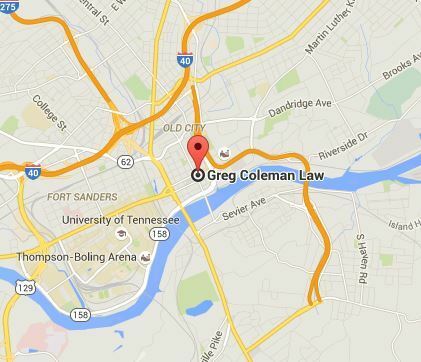 Contact Greg Coleman Law today by calling (865) 247-0080. Tennessee has certain requirements that could affect your medical malpractice claim when it comes to using the services of a medical expert before and during your trial. Most medical malpractice victims must meet the affidavit of merit requirement, also commonly known as the “certificate of good faith” requirement. This means that within 90 days of filing your claim for medical malpractice, your or your attorney must make a reasonable inquiry to determine that you have grounds for a good faith belief that negligence occurred. The way to show a certificate of good faith is to obtain a written and signed statement from a qualified medical expert who consulted in your case. He or she must be similar to the health care provider being accused of medical malpractice. This statement needs to be filed within 90 days or the court may dismiss your case entirely. There are also requirements medical experts have to meet in order to testify in court on your behalf. For example, they must be licensed to practice medicine in Tennessee or any bordering state and must have worked in the field during the year before your injuries occurred. The statute of limitations is a legal time limit for filing a lawsuit. It is a strict deadline that must be followed in order for you to have the chance to recover compensation for an injury. If you miss the deadline, you will lose the right to file a lawsuit. In Tennessee, medical malpractice claims must be filed within one year from the date the injury was discovered, but not more than three years after the date the injury occurred. According to Tenn. Code § 29-26-121, you are also required to give the liable party advanced written notice at least 60 days before filing a lawsuit. A written notice must include your full name and date of birth, the name and address of the attorney sending the notice and a list of the names and addresses of all medical providers being sent the notice. Not all injuries become apparent or noticeable after medical malpractice. If your injuries slowly developed or had hidden symptoms that delayed discovery of them until a later date, the discovery rule may apply in your case. In these cases, the statute of limitations would begin one year from the date your injury was discovered or should have been reasonably discovered. It is important to contact a licensed personal injury lawyer in Knoxville as soon as possible after medical malpractice has occurred. At our firm, we can determine when the statute of limitations started and when it ends based on your specific situation. This will help to ensure that we can file your claim before the deadline passes so you have the opportunity to pursue the compensation you deserve. There are several types of damages you can recover in a medical malpractice case. These include compensatory damages that compensate you for certain out-of-pocket expenses and non-economic damages which can compensate you for intangible losses that are difficult to monetize. The reality of suffering from medical negligence is that you may need more treatment to repair the damage caused by malpractice. However, if your case is successful, you may be able to obtain compensation for your medical expenses. This could include hospital bills, ambulance services, surgery, rehabilitation or therapy, medications, imaging and diagnostic tests, medical equipment and even the cost of travel to and from doctors’ appointments. Lost wages due to days or weeks of work missed after an injury can be compensated. You may be able to obtain past and future lost wages while you are in recovery. If your injury is so severe that it prevents you from working in the same capacity as you did before, you may also be entitled to recover compensation for lost earning capacity. This is the amount of money you are no longer able to earn because of the limitations created by your injuries. This covers any mental or physical pain and suffering you may be experiencing after your injury. You could have physical issues that prevent you from doing activities you once enjoyed or have emotional issues such as fear, anxiety and depression that greatly limit your ability to enjoy a happy and normal life. Loss of consortium helps to compensate for the suffering your spouse has experienced if you are no longer able to provide the same level of companionship, love and affection as you once did before your injury. In Tennessee, there is a cap or limit on non-economic damages, such as loss of enjoyment of life and pain and suffering. These damages are capped at no more than $750,000 for any type of medical malpractice. This cap can apply to either an isolated act or series of negligent acts which caused injury. There is an exception to the cap for certain types of injuries. In the event of a catastrophic injury, damages are capped at $1 million. This could include spinal cord injuries which caused paraplegia or quadriplegia, third-degree burns covering over 40 percent of the face or body, amputation of one or more of the hands or feet, or the wrongful death of a parent with minor children. Our Knoxville medical malpractice lawyers will know how to carefully evaluate your case to calculate all of the damages you and your loved ones have suffered and the value of those damages. He or she will also explain how to properly document these damages so that you can pursue all the compensation you are entitled. Our firm is ready to schedule your free consultation: (865) 247-0080. Have you or someone that you love suffered from medical malpractice? The dedicated Knoxville medical malpractice lawyers at Greg Coleman Law understand the difficulties many victims face after experiencing medical malpractice. We are ready to provide legal help and support through the entire claims process. Discuss your case with us during a free, no obligation legal consultation. We take cases on contingency which means no costs or fees up front. You only pay us if you obtain compensation for your case. Complete our Free Case Evaluation form now or call us at (865) 247-0080 to get started.